quadrotor | I Code Raven! Hey there! Thanks for dropping by I Code Raven!! Take a look around and grab the RSS feed to stay updated. See you around! Updates! So, among other things, I’m staying back on the BIRD project till December (The folks at UPenn graciously accepted my request to defer my admission by a semester) to do more fancy ML magic with quadrotors! :D (I promise loads of videos) The RISS program ended meanwhile, and I presented my very second academic research poster! However it was pretty jerky; whenever the drone reached a waypoint, it would suddenly speed up due to the significant change in error. Jerks are, of course, very bad since each jerk introduces a significant error peak as we integrate the velocities to obtain position. So, to mitigate this issue I implemented Drew’s suggested ‘dangling carrot’ approach – with the error term being restricted to a maximum look ahead distance along the direction to the closest waypoint. This finally resulted in the drone following trajectories pretty smoothly. The next thing I’m working on now is to provide a more intuitive sense of control inputs to the classifier. The intuition being that a bird always heads to the most open region in an image, rather than avoiding oncoming obstacles by rolling right or left. 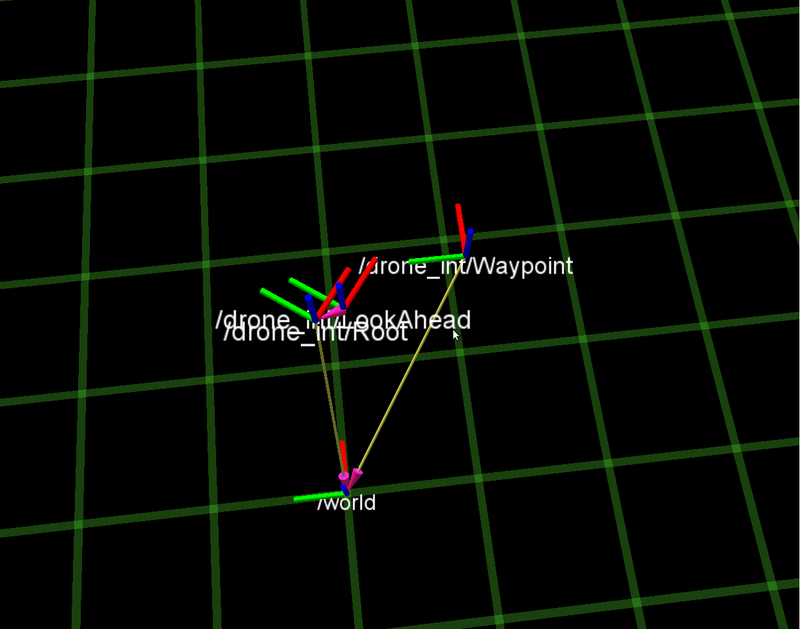 Towards this end I implemented a new controller that allows the drone to be controlled via a mouse. The idea behind the visual controller is to get the drone to move along rays in the image – thus mouse clicks correspond to a pair of yaw and pitch angles. Since the drone can’t move forward while pitching upwards (it would then just move backwards), my controller ramps the altitude with the forward velocity proportional to the tan of the pitch angle. The next step is to now interface this new controller with the classifier and see what kind of results I obtain and possibly get a paper out (yay!). I also beefed up the wxPython GUI that I worked on earlier the Summer to dynamically parse parameters from launch files (and launch files included within the launch files) and present all the parameters in one unified dialog to modify and save or load as required. This makes life much easier since a lot of parameters often need to be changed manually in the launch files during flight tests. 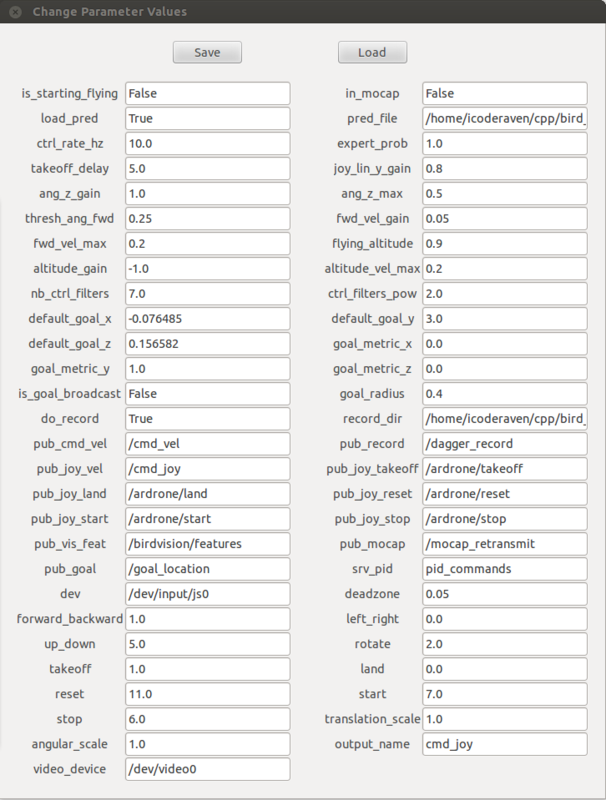 A sample screenshot of the parameters loaded from a launch file. The user can only launch a node if the parameters are loaded. boost is the secret of my energy! A log to record code progress, ephemeral thoughts, and reminders. Code on.